Among all of President Trump’s executive orders is one that would deny federal funding to “sanctuary cities” – cities that adopt a variety of practices to shield undocumented residents from federal immigration bans or deportations. Here’s what that might mean, and how two Supreme Court decisions hailed by conservatives might spell salvation for sanctuary cities. How much federal funding could sanctuary cities lose? You’ll see numbers out there – a Reuters news piece concluded that the 10 largest sanctuary cities stood to lose $2.27 billion in federal grants. This was a good faith effort to tally the cities’ possible loss of federal funding, but it is likely incomplete. It’s surprisingly difficult to know how much a city gets in federal funding. There is no federal data source that provides a comprehensive number – for instance, almost all cities get federal funds that are first routed through their state’s budget. And city budgets themselves often don’t distinguish the original source of funds. But whatever the exact numbers, it’s clear that a total loss of federal funding would be devastating for most cities. Among the potential casualties: funding for public schools; housing and economic development grants; customs and border enforcement at major airports and ports (yes, we note the irony); transportation funds for mass transit and highways; and more. A “gun to the head:” Is cutting federal funds for sanctuary cities legal? 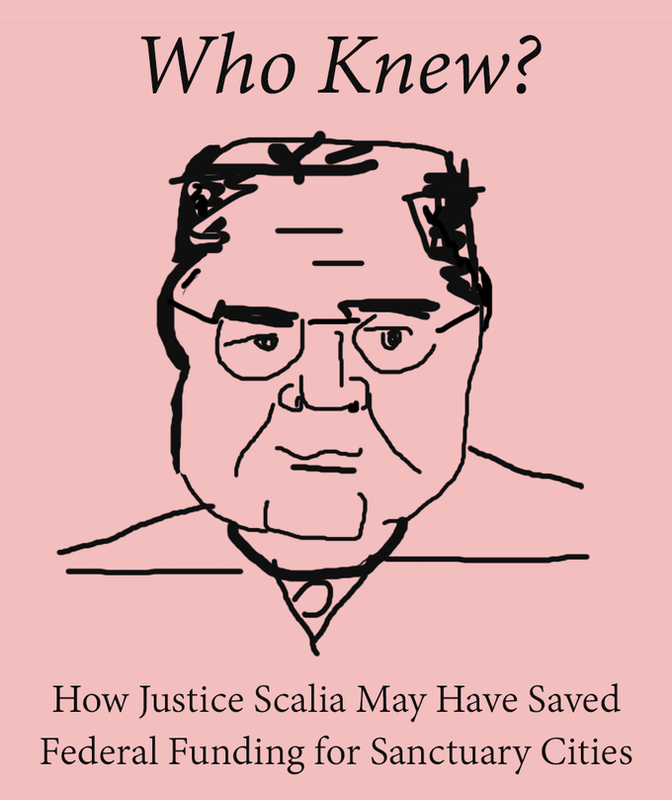 This is where some legal analysis brings in the late Justice Antonin Scalia and a couple of Supreme Court cases – Printz v. United States and N.F.I.B v. Sebelius, among others. In N.F.I.B v. Sebelius, a 7-2 majority struck down the part of the Affordable Care Act (that’s Obamacare, folks) that would have withheld all Medicaid funds from states that refused to expand the program (resulting in the patchwork system of Medicaid expansion that we have today). Chief Justice John Roberts wrote that the threatened loss of Medicaid funds would be so detrimental to state budgets that it acted as a “gun to the head,” and that would compromise states’ sovereignty. If the total loss of federal funds to sanctuary cities could also be called “a gun to the head” (which seems reasonable), it too might be unconstitutional. In a twist of history, a duo of Supreme Court decisions that limited background checks on guns, stopped the spread of affordable health care, and protected states’ rights – once synonymous with segregation and slavery – might spell salvation for sanctuary cities. On the other hand, some legal scholars have argued that since the executive order on sanctuary cities requires cities only to share information about undocumented residents with federal law enforcement, not to actually detain those residents, it steers clear of these limits (this argument is disputed). But even these scholars note that to be constitutional, the precise amount of federal funding withheld would have to fall short of representing a “gun to the head” for city budgets. With mayors of sanctuary cities promising lawsuits, if the administration attempts to enforce this order, the final answer will likely come from the courts. What federal funding are sanctuary cities most likely to lose? Even if courts determine that the executive order amounts to a federal overreach in power, there are some sources of federal funding that could still be cut. Three programs on this list are related to criminal justice and policing: The Edward Byrne Memorial Justice Assistance Grant Program (JAG; $376 million), the Community Oriented Policing Services (COPS, $212 million) and the State Criminal Alien Assistance Program (SCAAP, $210 million). These programs have occasionally received criticism from advocates of criminal justice reform. The JAG program, for instance, came under fire for allocating grants in proportion to arrests (which encouraged more arrests), a practice that stopped under the Obama administration. However, advocates often prefer that funding be used differently – not withheld altogether as the administration has threatened to do. Could sanctuary cities lose state funding? This threat is not subject to the Supreme Court decisions above, and would depend on state legislatures, governors and courts. No doubt Texas would not be the only state to attempt this route.